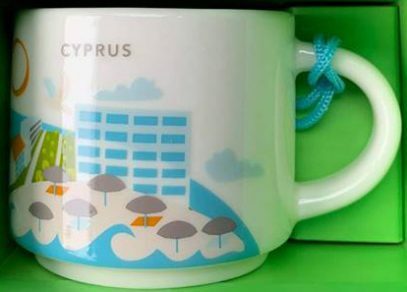 Starbucks You Are Here Ornament – Cyprus is a very nice looking mini mug with the blue being the most used color. The string is also light blue. And it’s no wonder, because blue and white are the national colors of Cyprus, which you can find everywhere on the island: from the national flag to multiple white houses with blue rooftops along the coast. 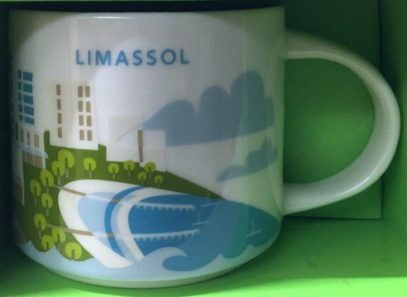 This Icon mug came from Cyprus. Dark Brown is used as its theme color. 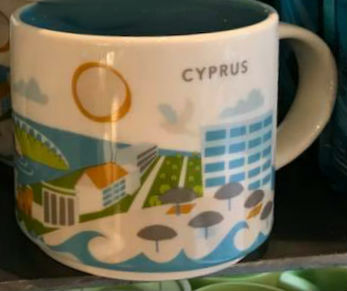 Paphos, The Tombs of the Kings can be seen on the front of the mug and Leada and the Swan Mosaic on the back.